We now are taking orders for fresh black suey and peeler crab please give 3 days notice. 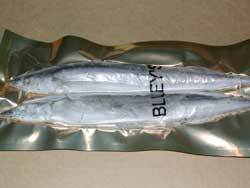 Mackerel, Squid, Sand Eel, Blueys, razor fish are in stock, along with a good supply of frozen peeler crab. We will update our site regularly with details of fresh Peeler Crab and Black Suey . Why not fill your details in, on the home page bait bucket for our automated service. sold in packs of 10 for £2-50. Chinese calamari party squid great sea bait for all kind of species comes into its own in winter sold in 500 gram packets frozen £2.75. California calamari squid good all round bait as above comes into its in winter sold in frozen 1lb boxes £3-00. Blueys are similar to mackerel they have come into there own over last few years, and are used by many of today's pike anglers.